Available on both DVD and Blu-ray, Baby Mama is the predictable comedy about a women in her late 30’s, attempting to start a family. Starring the talented and witty Tina Fey (30 Rock) and Amy Poehler (Blades of Glory), writer and director Michael McCullers successfully creates a feel good movie about a successful and single business woman who is yearning to be called mother. Unfortunately for Kate Holbrook (Tina Fey), she has waited too long to become a mother and is forced into surrogacy by “hiring” working girl Angie Ostrowiski (Amy Poehler) to sire her child. It’s a tale of lower class meets upper class that although most viewers will see the inevitable plot unwind, it’s great to see Fey and Poehler bounce off each other with some hilarious results. 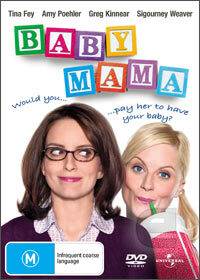 With the theme of “family”, Baby Mama may be clichéd at times, however is the perfect movie for a night in. Definitely worth investigating if you’re into feel good and comedic films.